Each individual experiences different psoriasis symptoms based on their overall genetic factors, age, type of psoriasis they have and general health. While many symptoms occur with each type of psoriasis, it is important to know the differences because they can help the doctor make an accurate diagnosis and therefore, provide the correct treatment. When diagnosing children, reviewing the symptoms is very important because of limited treatment options and side effects associated with aggressive medicinal approaches. In the most common form of psoriasis, known as plaque psoriasis, the symptoms tend to stand out from those in the other forms of this disease because of the upsetting aesthetics. For individuals suffering with this ailment, some of the early signs include dry, red skin in small or large patches anywhere on the body, including the inside of the mouth. The affected areas have itchy raised lesions covered with whitish, silvery scales and can be painful. The number of patches differs with each person and each outbreak, as you might have many affected areas or only a few. However, all of the patches and lesions may become so dry the skin splits and bleeds. One of the symptoms separating guttate from any other form of psoriasis is the fact it only occurs in children, young adults, and rarely, in infants. Another unique sign your child may have guttate psoriasis is if the outbreak occurs after they overcome a viral or bacterial infection, such as a respiratory illness. The lesions associated with this type of psoriasis tend to be small, flat spots as opposed to elevated patches and people often confuse the drops with chicken pox. The most affected areas consist of the head, torso and appendages. Additionally, these outbreaks have a high chance of going into long periods of remission and may not come back until adulthood; however, this disease is permanent and never goes away, no matter how long the remission lasts. Psoriatic arthritis does not usually come with serious arthritic problems but it sometimes promotes damage to the joints over time and can encourage joint stiffness. The rarest form of psoriases, the symptoms for this disease have subtle but important differences from plaque psoriases. For instance, the redness, itching and burning still exists but, it covers your entire body in the form of a peeling rash. Other types of psoriasis can lead to this condition if you do not manage them properly, while some medications and extreme sunburn also act as triggers. 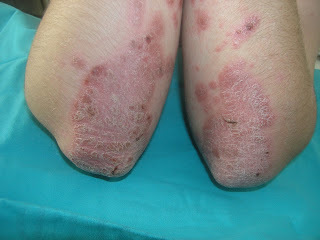 The main difference in psoriasis symptoms with this condition is the lack of scales and crust as well as its location. Inverse psoriasis mostly affects the folds of the skin, such as behind the knees, in the elbows, and under the breast. However, this type of psoriasis, which occurs mostly in people dealing with obesity, can make itself present in the folds of excess skin anywhere on the body. While not as painful or disfiguring as the other types of psoriasis, it may be more difficult to treat simply because outbreaks occur from moisture and the folds of the skin naturally produce a wet environment. As you can see, the different forms of psoriasis all have their own unique symptoms but also some similarities. If you notice any red areas of skin, large or small, you might be witnessing the first of the psoriasis symptoms and should schedule an appointment with your doctor. In doing so, you can manage the outbreak early on instead of waiting for it to become worse.